Spencer is a full-bodied, golden-hued ale with fruity accents, a dry finish and light hop bitterness. The beer is unfiltered and unpasteurized, preserving live yeast that naturally carbonates the beer in the bottle and keg and contributes to the beer's flavor and aroma. 11.2 oz. bottle. Nov 15, 2018 | By Astrid D.
Being from Belgium, I must say that I really like that beer to the point where I gave a bottle to a friend and he liked it too. I told him that it was brewed in a monastery in MA and made just like the monks in Belgium. He said that he will buy it. 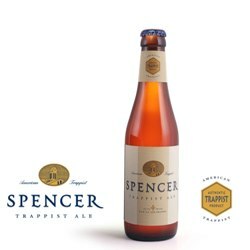 Spencer Trappist Ale is a very special beer which can be difficult to enjoy depending on your location. Thanks to the brewery and Monastery Greetings for the opportunity to sample some fine work from Joseph's Abbey. The shipment was very well cared for and arrived in impeccable condition. Note that shipping is not climate controlled so choose appropriate weather in depending on your approximate shipping route. This beer has two levels of flavor that can be altered by carefully pouring the beer into the proper Spencer "Chalice" and allowing the yeast (the B complex vitamins) to remain at the bottom, to be consumed separately. When poured like that, the flavor is light and aromatic. Giving a brisk sensation at the back of the palette. With a crisp aftertaste. If the yeast is married to the beer by a swift shake prior to pouring, or when its consumed separately, the flavors are heavier and more complex. In the second form, the beer can be allowed to lose its chill and enjoyed over a long period, like a fine wine. With a cigar. May 13, 2017 | By Jerome C.
Spencer taste like a real Belgian beer, with lots of subtleties in its aroma. If you like Leffe beer, you will definitively enjoy Spencer!